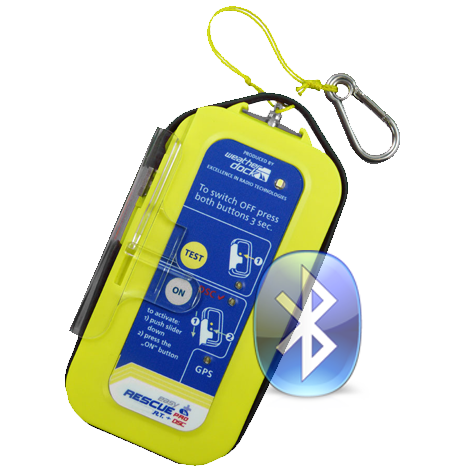 The easyRESCUE-PRO (BT) rescue transmitter has an integrated Bluetooth-LE module. This allows easily and fast the programming of the up to 8 different MMSI numbers in the rescue transmitter. Get the best of both to alert vessels about situation of distress If a „MAN OVER BOARD“ situation happens, you need to keep the victim in sight. It is essential for his survival. The easyRESCUE-PRO has been developed based on the well-known and approved AIS S.A.R.T. device easyRESCUE. In addition to the AIS locating functionality, the easyRESCUE-PRO has got another built-in VHF alert: DSC distress call (MOB) By means of DSC distress call, other vessels having DSC controllers aboard are able to provide support as a potential emergency responder. It‘s a lightweight personal locating device which is fixed to clothing or lifejackets and which can be mounted onto a pole for use on life rafts. Function Upon activation, the easyRESCUE-PRO device starts transmitting position reports via AIS, providing the current GPS position along with COG, SOG and its individual unit ID. The victim‘s position is updated every minute and transmitted 8 times per minute for at least 96 hours, depending on the DSC closed loop distress acknowledgment. Therefore the crew of the ship will know exactly the victim‘s position, as well as every other ship with an AIS receiver or DSC controller within range. When in emergency, AIS messages are transmitted. It triggers a safety related message on every AIS chart plotter with a worldwide standardized symbol. 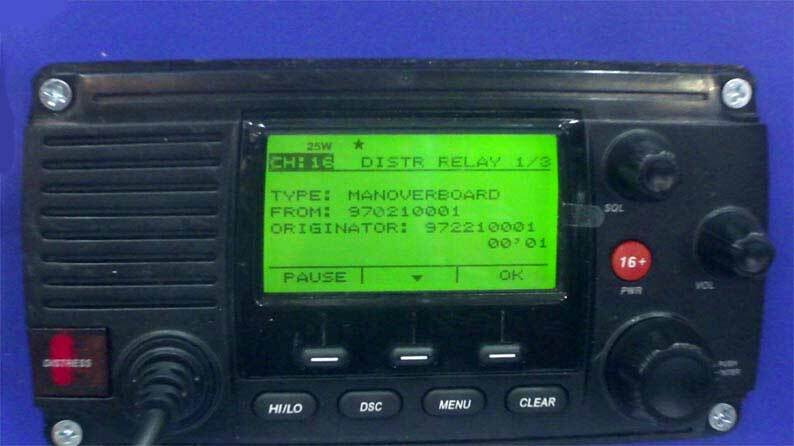 By means of DSC distress call (MOB), this signal can be received by the GMDSS (Global Maritime Distress and Safety Service), which is installed on numerous vessels and shore stations. The MRCC (Maritime Rescue Coordination Center) is part of the GMDSS (DSC) network. The easyRESCUE-PRO starts sending “closed loop” DSC distress alerts when activated. This “closed loop” message is addressed to the own ship of the victim. Up to this time no global alarm is initiated. The crew on the own ship can decide to rescue the victim on this own and send out a DSC acknowledgment to the easyRESCUE-PRO, which stops sending DSC messages. In addition, the easyRESCUE-PRO offers the possibility of programming up to eight mother ships ID numbers (MMSI) into the device to those users, who often need to change a vessel like pilots, SAR crew members, etc. 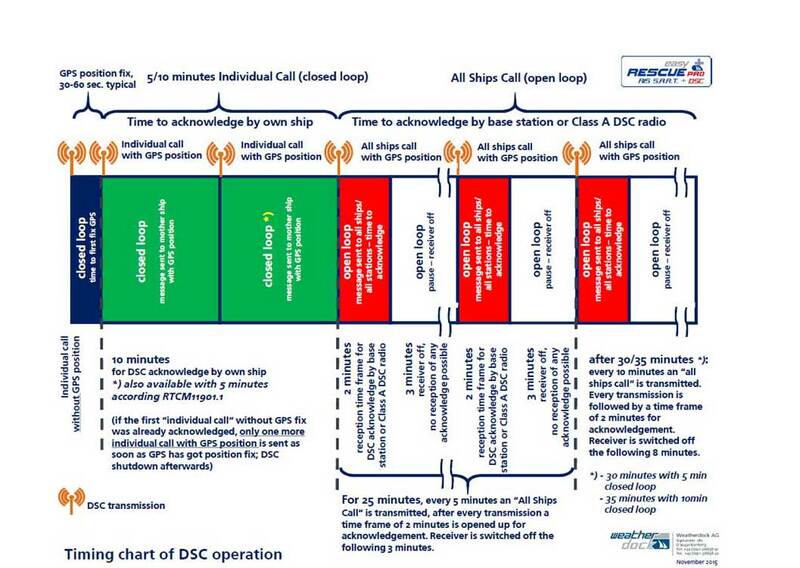 Any vessel within the “closed loop” group (up to eight vessels) can acknowledge these distress telegrams, which lead to a termination of the DSC distress calls send out by easyRESCUE-PRO. If the “closed loop” distress telegrams are not acknowledged, the easyRESCUE-PRO starts sending „open loop DSC distress calls“ (MOB) to all ships. Now the shore station or other commercial ship stations nearby can acknowledge this message and the easyRESCUE-PRO will also cease transmitting DSC. The global rescue operation will go on. What is necessary to run the easyRESCUE-PRO? The easyRESCUE-PRO needs no additional accessory. The device is ready to use, grab‘n‘go! An AIS receiver and a DSC controller are strongly recommended as a radio equipment on the own ship. Only then a fast and effective rescue operation can be conducted by the own crew.